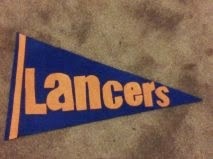 Sometimes you just can't find a pennant for a favorite college, high school, or other sports team. When that happens, you can make your own for under a dollar! 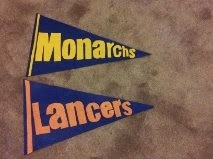 My daughter made these pennants for her dad's "man cave" of the two high schools that our kids attended. It was easy and inexpensive. The hardest part will be setting up the team name on paper to fit the size of the pennant, with each letter a little smaller than the letter before it. Ribbon in alternate team color. With a yard stick or other straight edge, measure from the corners of one side of the 11 x 14 felt to the middle of the other end. and mark those lines with a pencil/pen to create a pennant triangle on the felt. Cut out along the marked lines so you have a pennant. Print out onto paper /cardstock the team name. You will want to pick a font that has a simple block lettering. Using the pennant you cut out as your guide, play with the size of each letter. If your team name is long you will need to plan on a smaller font size to fit the whole name on the pennant. 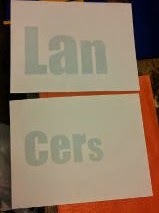 Cut out the letters from your printout of the team name. Cut out each letter from felt. Space each letter across the front of the pennant. Do not glue down the letters till you like the position of each letter. Glue down the letters in desired location. 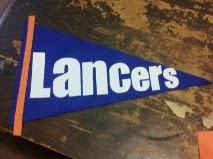 Cut a piece of ribbon to fit the end of the pennant near the first letter, and glue in place along the edge. Ready to hang with command poster strips.